These are invaluable and versatile pieces of equipment. 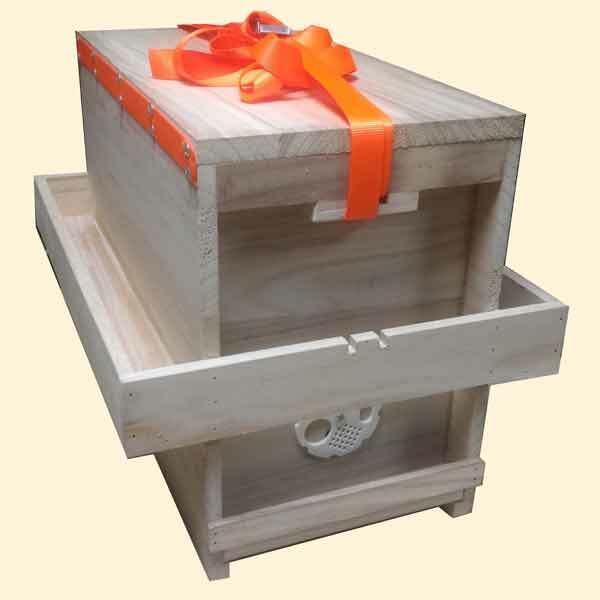 These are designed to be simple and light weight so they are easy to carry and transport all the beekeeping tools and paraphernalia that may be needed in the apiary. The removable nylon strap with cam buckle is adjustable so it can be used as a handle or shoulder strap or to secure a swarm of bees inside. There is a hive entrance complete with rotating entrance block and a stainless steel mesh floor so the tool box can be used to temporarily house a swarm or nucleus colony. The lid is hinged and can also be secured. Inside the box it is top bee space, wide enough for 6 National Hoffman frames, deep enough for National Extra Deep 14x12 frames. Outside the box there are trays for storing tools on all 4 sides. Tools shown are not included. All woodwork is knot free untreated solid 12mm timber.